Regular dental exams are essential to not only your oral health but also to your overall health. The mouth is often viewed as separate from one’s overall health and is often overlooked. However, the maintenance of good oral hygiene and health is an essential part of living a healthy life. Gingival health: We do a thorough evaluation of your gums for gingivitis and gum disease to determine the best treatment and type of cleaning for you specifically. While daily brushing and flossing removes some plaque, it is not effective at removing all of the plaque from your teeth. If plaque sits on your teeth long enough, it will build up and harden into tartar, which can only be removed by a dentist or dental hygienist. If this build-up is allowed to accumulate, it can lead to periodontal disease, tooth decay, and eventually tooth loss. Preventative maintenance: Not only does your biannual dental exam and cleaning help keep your teeth free of plaque and tartar, but your dentist will also be able to spot the earliest signs of gingivitis and tooth decay. Catching tooth decay before it starts and gingivitis before it advances are essential to treating them effectively. occlusal exam: Not only does your biannual dental exam and cleaning help keep your teeth free of plaque and tartar, but your dentist will also be able to spot the earliest signs of gingivitis and tooth decay. Catching tooth decay before it starts and gingivitis before it advances are essential to treating them effectively. X-rays: X-rays are essential in Dr. Ema’s ability to ensure that all signs of infection or damage are caught and tended to as soon as possible. Oral cancer screening: During your regular exam, Dr. Ema will perform an oral cancer screening to check for any early warning signs. Early detection is the best way to ensure positive outcomes. She will check your face, lips, gums, tongue, and throat for any signs of oral cancer. Medical history: Dr. Ema will also review your medical history during your exam to ensure that any changes are accounted for. Certain medications or conditions can put you at greater risk for things like gum disease, so being aware of these changes in your health history allows Dr. Ema to keep an eye on any potential changes in your oral health. Your preventative dental check-up exam is just as important as your other healthcare checkups. At Printers Row Dental Studio, your oral health is our top priority! 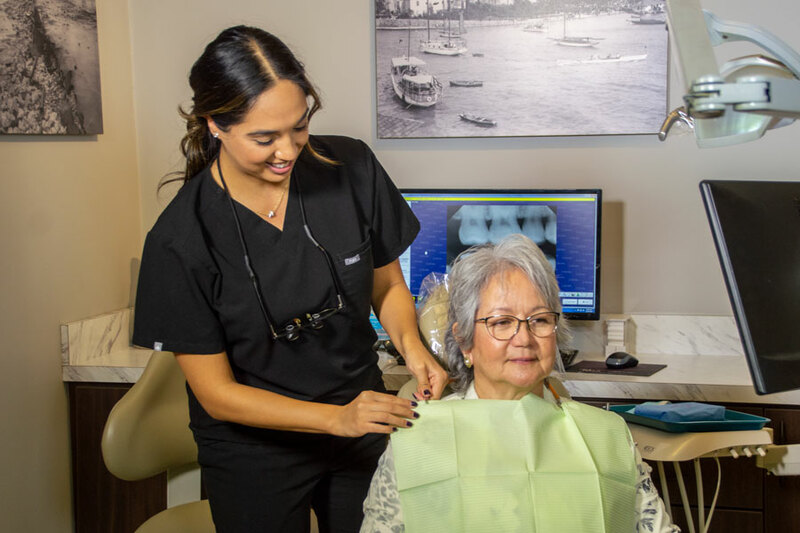 We are here to answer any questions that you may have about your overall oral health, as well as ways to ensure that you maintain a strong, healthy smile. Dr. Ema and her team of experienced dental professionals are devoted to keeping your mouth healthy so that you can live your best life. If it’s been a while since your last dental exam, call us today at (312) 435-0411 to schedule your appointment!